In August 2016, the team at The BELFAST Programme, and The Belfast Unemployed Resource Centre hosted an evening to discuss methods to teach Absolute Beginners. The aim of the evening was to introduce methods to those who had little or no experience in the teaching of absolute beginners, and how best to go about it. These methods had been used in the Middle East for 30+ years, then refined for a different student type in Belfast over the last few years, before being put into practice with our new Syrian refugees. Arthur McKeown interviews Aisling Cartmill so she can tell us all about what BURC - The Belfast Unemployment Resource Centre is and does. Introducing the very first Belfast Programme Podcast to the world featuring Arthur McKeown and Alan Hall. In this podcast we introduce everything that The Belfast Programme covers, what BURC is and what we hope to do in the future. Comments and feedback would be most welcome. Presentation given in Dungannon regarding English language teaching at a Pre-Esol level for refugees in a community setting. Delivered by Arthur McKeown. An introduction to the Pre-ESOL Absolute Beginner Compendium, compiled by Volunteers at the Belfast Unemployed Resource Centre. In the summer of 2016 The BELFAST Programme started our own podcast channel. 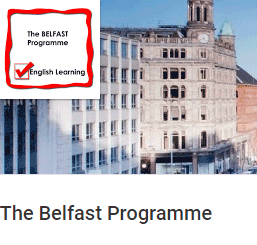 This is used to introduce our projects, the team working on the programme, other bodies and people around the world that we are in contact with and deal with, and discussing what Belfast has to offer both for our students and our volunteers. Our podcasts and other media also go online and you can view or listen on YouTube. Below are our BELFAST Programme Newsletters which are sent out to everyone periodically. Click each to view for free.